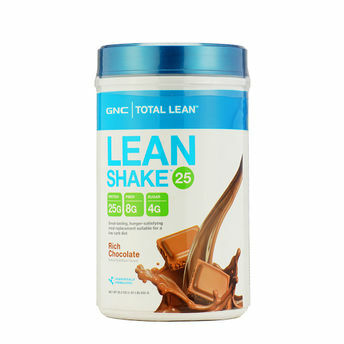 GNC Total Lean Shake 25 offers a well-balanced blend of high quality protein, fiber, vitamins, minerals, and fat. This great tasting combination makes a healthy addition to you dietary regimen. With 25 grams of high quality protein per serving, Lean Shake 25 can be an effective way to increase your feeling of fullness and satiety. Dietary protein can also help support lean body mass. Each serving of GNC Total Lean Lean Shake 25 also includes 8 grams of fiber including oat beta-glucan.